Community activist Neil Clark. Picture by Louise Glen. Summer months bring money and visitors to the town and surrounding area but also many thousands of cars, bringing roads to a standstill. There is, however, increasingly no let-up during the winter months, with the reputation of stretches of the A82 as some of the busiest stretches in Scotland proving well-founded. Exhausted locals have now called for not one, but two solutions to the traffic problems, demanding both a bypass and a relief road at a pinch point on the route. The Nevisbank Roundabout takes drivers from Fort William to Inverness or Mallaig, with vehicles exiting left to the north road and straight on to Glen Nevis, a popular tourist way. Residents claim it has been causing almost an hour of daily delays, leaving town commuters tearing their hair out. Community councillors have become increasingly furious that a lasting solution has not been found, with Neil Clark – a former Highland councillor – demanding answers be found. Mr Clark said: “I would love to know how much time, energy and money has been put into finding a solution in the last 40 years, and all it has saved is three seconds. “I think we need to think of both a by-pass and a relief road. The traffic into Fort William has increased to the point that we don’t know what to do with all the cars. 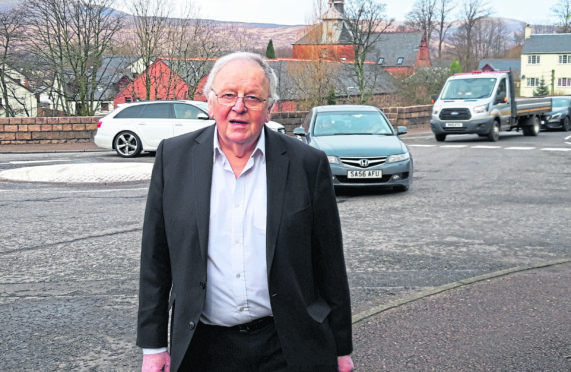 Councillor Andrew Baxter added: “Fort William continues to be a bottleneck for anyone travelling up the West Coast during the busy summer months. “No single body can solve this problem on their own. “We need a bypass or relief road and there is no point in Transport Scotland spouting the normal mantra that it is for the council to resolve. “It is a trunk road problem and it needs funding on that basis. In January, a Transport Scotland spokesman said: “Transport Scotland officials met with the Fort William Congestion Working Group last month and agreed to commission a further report to identify additional improvements to the trunk road through Fort William.